Earlier today, while unveiling the new revolutionary iPad with Retina display and the third generation AppleTV, Apple released iOS 5.1. A separate update will be released to upgrade the software in the second generation AppleTV which also runs iOS 5. 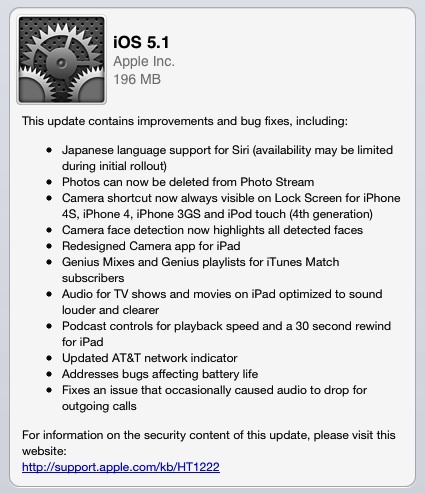 To receive the update on your iOS 5 device, go to: Settings > General > Software Update. If you prefer to update your iDevice the 'old fashioned' way, or haven't yet installed iOS 5, connect your handset to your computer running iTunes 10.6, also released today, and sync your device. Then select your iDevice from the iTunes source pane and click the "Check for Updates" button in the pane on the right.